Sun Street is in the conservation area of Lewes situated in the area known as the ‘New Town’ in the parish of St John sub Castro. 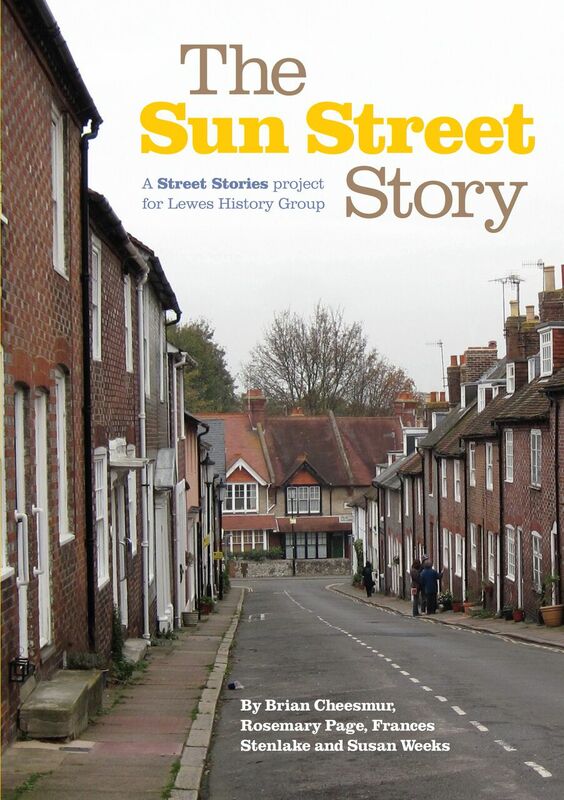 A team from the Lewes History Group began to research the history of Sun Street in 2013, and were inspired by those who attended their very successful exhibitions in 2014 and 2015 to produce a book which describes their very interesting findings, and which includes previously undocumented information about Sun Street. The authors describe the origins of Sun Street and the construction of the houses, and also unexpected findings such as the employee of Albion Russell and Co. (forerunner of Russell and Bromley) who had previously made boots in Sun Street. Other discoveries were that the Lewes Wanderers cycle club’s home was the Fruiterers Arms, and that in the 1950s the Salvation Army held Sunday meetings under a gas lamp in the street. The book includes previously unpublished family photos of the current and former residents of the street, along with photos of the model of the 1960s proposed Relief Road, found on a high shelf at the East Sussex Record Office. The book also includes stories of unfortunate residents hauled before the local magistrates and of those serving King and Country. The November 2016 Lewes History Group meeting featured “The darker shades of Sun Street” a dramatic presentation by Lewes Little Theatre, accompanied by Valmai Goodyear of Lewes Folk Club, created from the Sun St Street Story team’s work. This performance was recorded and is available at Rocket FM. The December 2016 Love Lewes Podcast also features co-author Rosemary Page talking about The Sun Street Story, and the activities of the Lewes History Group.